Today’s second World Cup semifinal was bound to be closer (and lower scoring) than yesterday’s German rout of Brazil. Indeed, this one was at the other extreme, with Argentina defeating the Netherlands in a penalty shoot-out after neither team scored in regulation or extra time. So as if things weren’t already bad enough for Brazilian fans, their rival will now play Germany in the final on Sunday. Relive the match with our GIF recap. The first dangerous moment for the Netherlands: this Lionel Messi free kick, which was safely caught by goalkeeper Jasper Cillessen. For the third time in this World Cup, the Dutch didn’t register a shot on goal in the first half. They went to the locker room at halftime in this one tied 0–0. The Netherlands had this chance late in regulation, but couldn’t score. After failing to register a shot on goal in the first half, the Dutch didn’t get one in the second half, either. The game went into extra time, still tied 0–0. Neither team scored in extra time, and so the game went on to penalty kicks, where Sergio Romero stopped Ron Vlaar on the Netherlands’ first attempt. 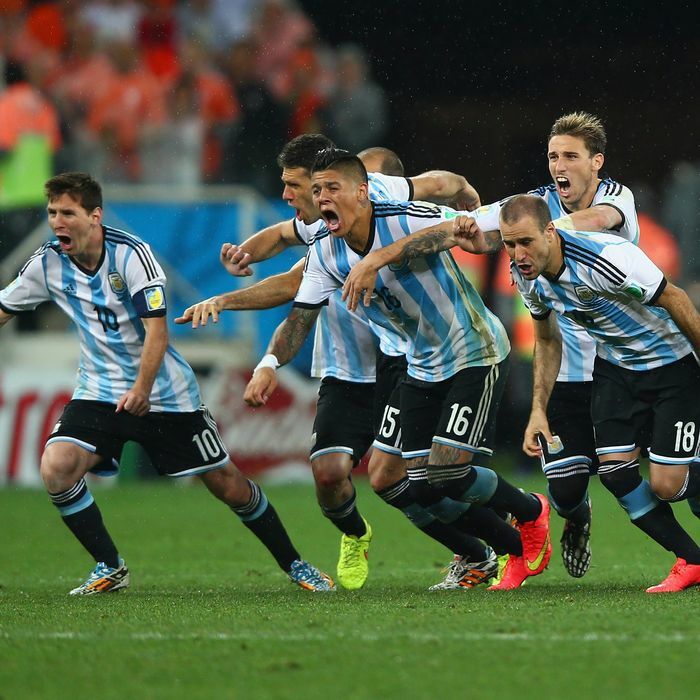 Romero was psyched, and so was Argentina’s bench. Messi went first for Argentina, and scored.